Gilbert Building, 205-219 West 39th Street. The Work of George & Edward Blum, Architects, 1935. Collection of The Skyscraper Museum. The setbacks required under the zoning code are evident in the design of the Gilbert Building, an industrial loft representative of the economic and zoning forces that shaped the Garment District. The Gilbert Building occupies a large plot on 39th Street, stretching through the block to 40th Street. The plot was assembled in 1921 by a syndicate of three garment manufacturers, William Fischman, Joseph Heit, and Hyman Rubin, and the builder Joseph Gilbert. 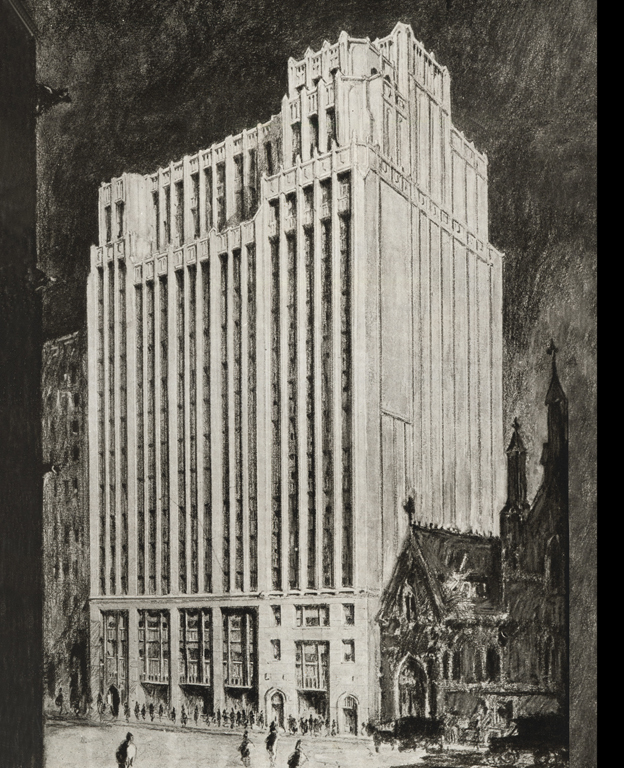 The syndicate planned an enormous 16-story building on the 39th Street frontage that would be named for Gilbert. Each of the sponsoring manufacturers took two floors of the completed building. The design was placed in the hands of the architectural firm of George & Edward Blum. The Blums were among the most active architects in the Garment District, designing nineteen lofts. The Gilbert Building typifies the lofts of the 1920s. It has a three-story base faced with limestone and articulated by large windows that lit stores, showrooms, and factory floors. The upper stories are brick, modestly trimmed with terra cotta. The height is accentuated by bands of vertical windows. As required by zoning, the upper facade has a series of setbacks, with a tower-like massing to the right, creating an asymmetrical crown. The need for good light and ventilation in the individual lofts resulted in extensive windows on 39th Street. On 40th Street, they erected only a 2-story structure to protect the north light, increasing the desirability and marketability of the rental lofts. When the building opened in 1923, it was occupied by 19 firms manufacturing dresses, gowns, cloaks, and suits.